Looking for something for that special teacher in your life? Well, you have come to the right place! Let me create a special gift from your child and delivery it to your home or office. Prices start at $5 and all items are customizable. THE most requested gift for the end of the 2013-2014 school year! 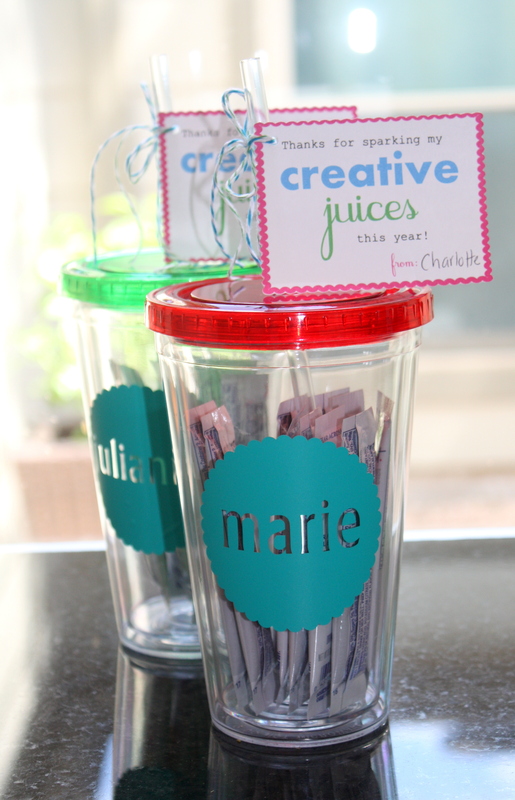 A clear, insulated cup with plastic straw is filled with lemonade packets and tells the teacher, “Thanks for sparking my creative juices this year!”. Add your teacher’s name to the outside to complete the gift. Make any teacher feel special and hydrated. NEW for 2015! 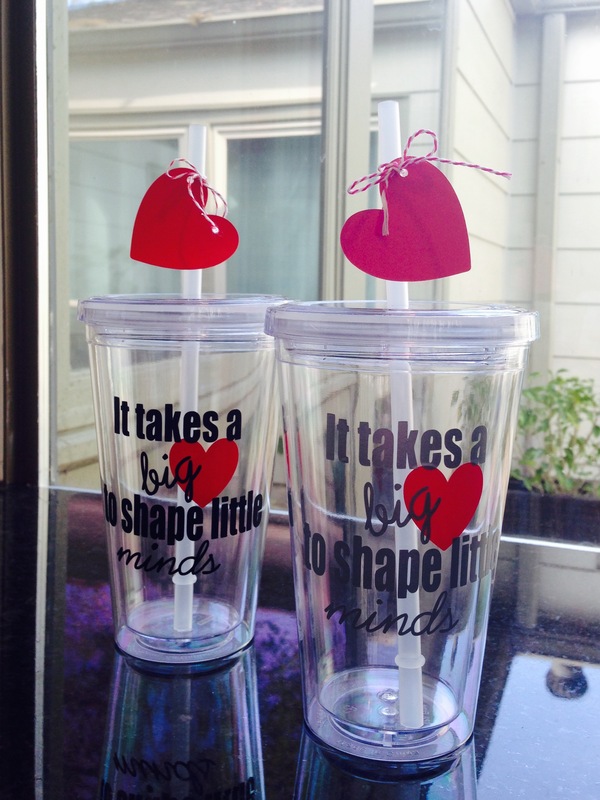 These dishwasher safe, insulated cups read “It Takes a Big Heart to Shape Little Minds”. Your choice of colors (shown here in silver/pink and black/red) and all cups come with a matching heart tag. 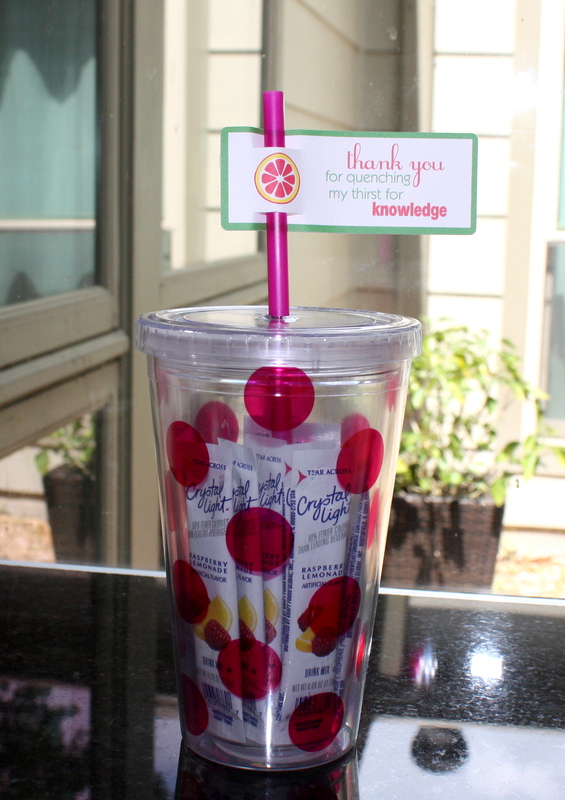 Also NEW for 2015, these pink polka dotted cups are topped with a matching tag that reads, “Thank You for Quenching my Thirst for Knowledge” and are filled with Crystal Light Raspberry Lemonade (or your choice of drink). 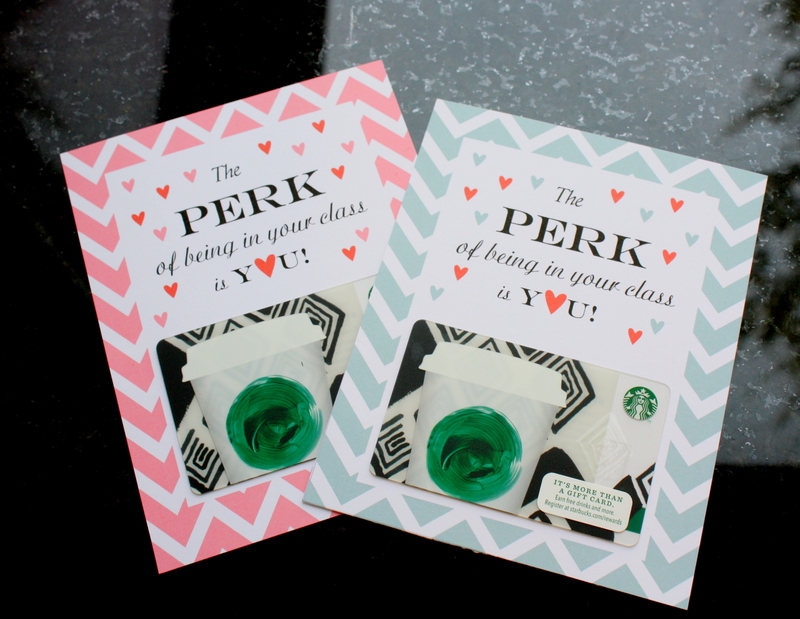 For a quick, easy gift, give any teacher this clever coffee gift card holder. You choose pink or gray and where the gift card will be from. Included is an envelope and the guarantee that your child’s teacher will get just what he/she wants – whatever they would like to buy! Send your teacher off to summer with all she needs to relax and recharge. 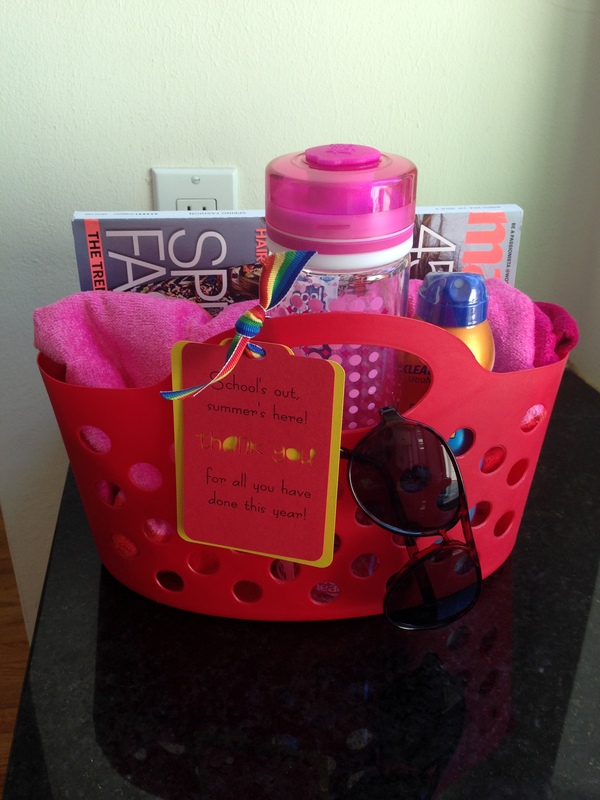 This tote bag is filled with a beach towel, water bottle, magazine, sunscreen and sunglasses. A great gift from the whole class or for that special teacher who has gone the extra mile for your child. 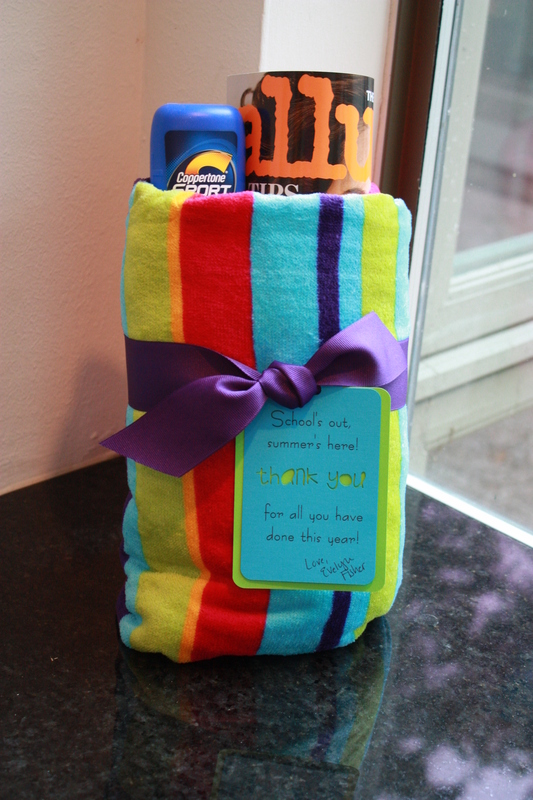 A smaller version of the School’s Out tote, this cozy beach towel is wrapped around a fun summer magazine and sunscreen. Topped with the same tag that reads, “School’s out, summer’s here, thank you for all you have done this year!” this gift will ensure your teacher knows how much she means to you. Need to say Thank You to that coach who has given his/her all for your kiddo? 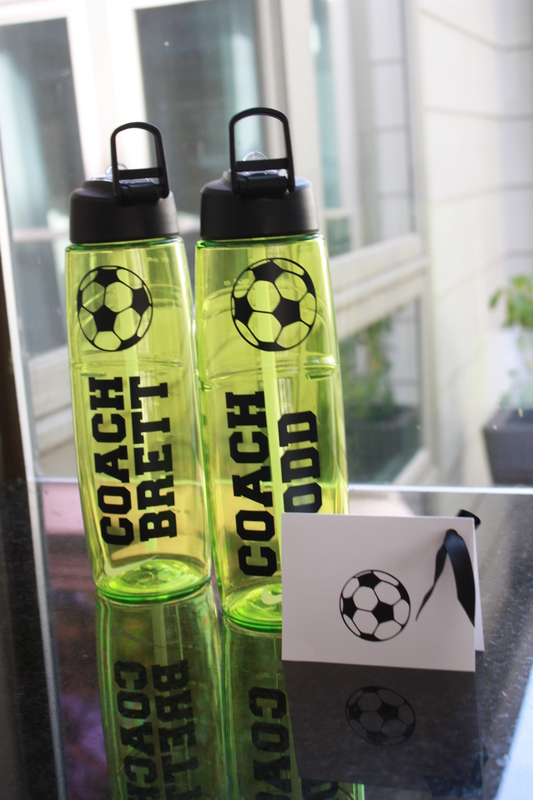 They will love this personalized BPA free and dishwasher safe water bottle! You pick from a red, green or blue bottle which comes with a card fitted for a gift card or just a note of thanks. Show your child’s teacher that she is Marvelous and Magnificent with this fun and yummy gift. 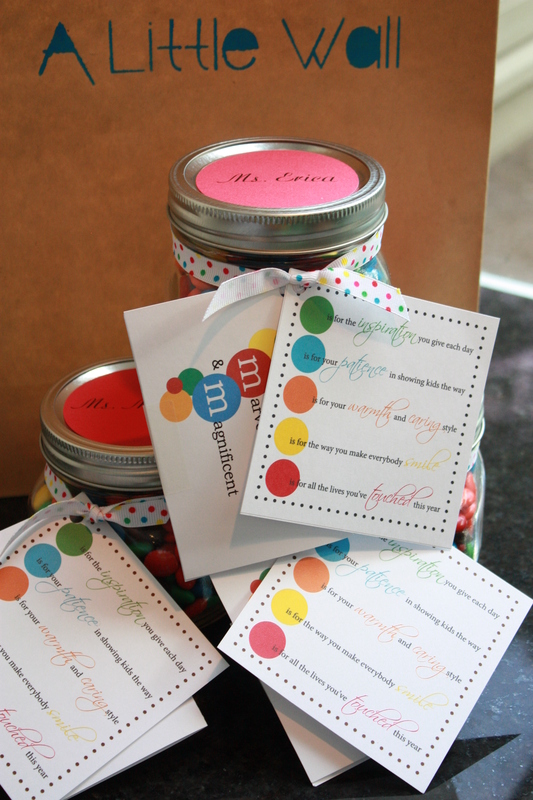 A small glass jar is filled with M&Ms and topped with a personalized label. There are two cards tied around the top with matching polka dot ribbon. The first one can be used to house a gift card or just a simple note of thanks. The other tells what each color of the M&Ms represent. This is really a thoughtful and sweet gift. Have a tech friendly teacher or one who needs to store a lot of things (who doesn’t)? Let him or her know that you appreciate all they do with this gift. Under the label is an 8 GB storage drive, plenty for storing photos, music and videos of your budding Broadway performer. 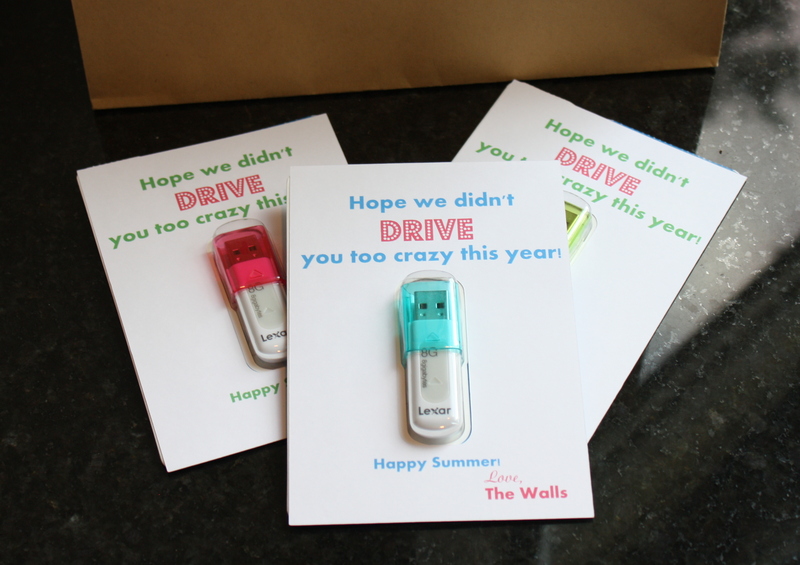 The tag reads, “Hope we didn’t drive you too crazy this year!” for an end of the year gift, or “Hope we don’t drive you too crazy this year!” for a beginning of the year gift. It would also make a great gift for your ancillary teachers, principals, etc. I love this gift for teachers and for crossing guards! Yes, let’s not forget about that man or woman who helps your child cross the street safely each morning. 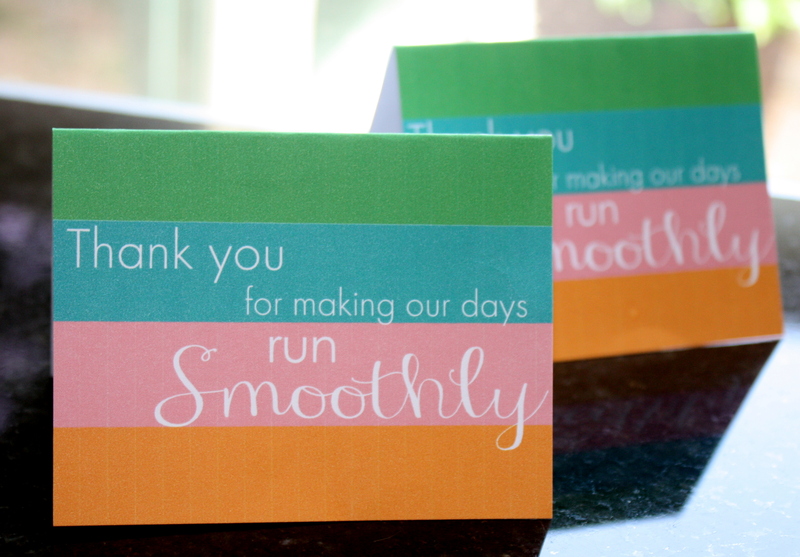 This card is the perfect size for a gift card for ice cream or smoothies and comes with a matching envelope. Really, anyone would like to receive this card. Surprise your child’s teacher with a sweet treat for those early mornings! Your personalized “Donut know what we would do without you!” label comes attached to a brightly colored bag filled with your choice of powdered sugar, cinnamon-sugar or chocolate covered donuts, sealed in a plastic bag. This one was a big hit with my son’s teachers! To order any of the above, please use the contact form below to let me know which item you would like, your teacher’s name, child’s name and when you need the item delivered. Don’t see something that fits your teacher? Check out my Pinterest page for other ideas and email me with your request. I would love to recreate most anything to fit your needs!